The GDM-8261 is a high precision 6 ½ digit Digital Multimeter with dual measurement displays, 11 measurement functions and 10 math functions at high accuracy (35ppm DC voltage accuracy) to accommodate the most frequently performed parameter measurements in various application fields today. The GDM-8261 adopts a scanner card, which carries 16 V-Channels and 2 I-Channels, to facilitate the measurements of multiple-test points on either a device or multiple devices all at a press of a button. With this multi-point measurement capability, the GDM-8261 can be used as a semi-auto ATE System to increase the throughput of manufacturing test or as a data logger to perform long term monitoring or characterization of a DUT. A PC Software, DMM-Viewer, is available with GDM-8261 to support multi-channel panel setting and data logging of the scanner card. Besides, a LabVIEW driver is also supported to help user create his/her own virtual instrument on the PC screen for easy programming. For ATE system measurements or remote control applications, both USB and RS-232 Interfaces are provided as standard, and either GPIB or LAN can be selected as optional interface for the GDM-8261. The GDM-8261 includes all the basic measurement functions that are required for engineers to handle design, development and testing jobs for electronic circuits or products. The basic measurement functions include voltage, current, resistance, diode, continuity, frequency and temperature. Remarkably, the current measurement function covers a very wide range from 100uA to 10A for DC current (in 6 ranges) and from 1mA to 10A for AC current (in 5 ranges). In addition, the GDM-8261 features 10 Math functions (dBm, dB, compare and other mathematical operations) to accommodate specific measurement requirements and complex measurement applications. Unlike most of the “dual display” digital multimeters, which show test result on the primary display and range information on the secondary display, the GDM-8261 is able to perform two measurement functions simultaneously and shows the test results on primary display and secondary display respectively. The GDM-8261 supports an almost unlimited number of measurement combinations of dual measurement functions, besides the normal test result and range information displays, greatly increases the test speed of multi-function measurement tasks. The GDM-8261 offers an exceptionally high resolution of 0.1μV for voltage measurement, 100pA for DC current measurement, 1nA for AC current measurement, and 100μΩ for Resistance measurement. This level of resolution and accuracy becomes a must for the precision measurements in specific applications. In addition, the GDM-8261 is capable of acquiring 30 measurement readings/s at the display resolution of 6 ½ digits and 2,400 readings/s at the display resolution of 4 ½ digits. The fast acquisition rate of the GDM-8261 adequately meets today’s measurement demands. 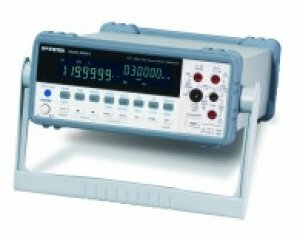 The GDM-8261 offers two methods, both 2-wire and 4-wire, for resistance measurements. The 2-wire measurement is most commonly used for resistance measurement in the range from 100Ω to 10kΩ. Whereas the 4-wire connection is normally applied for resistance measurement at a value lower than 100Ω. When applied, 4-wire measurement automatically compensates the test lead resistance and connector contact resistance to get an accurate measurement result. The GDM-8261 is able to acquire and record 2 ~ 9999 measurement readings for the “store” and “recall” functions. This allows an immediate observation of the maximum, minimum, average or standard deviation values of all the recorded data whenever the data acquisition stops. The “Math” function of GDM-8261 includes four mathematical operations for measurements: MX+B, 1/X, Percentage and Stats. “MX+B” multiplies the measurement reading (X) by a factor (M) and adds/subtracts an offset value (B) to calculate linear offsets or scales. The “1/X” function divides 1 by the measurement reading (X), calculating the inverse of the reading. The “Percentage” function calculates the ratio of the measured value to a target value using the following equation: (Reading X – Reference)/Reference x 100%. The “Stats” function makes statistical calculations continuously or by a user-defined measurement counts. The statistical calculations include Maximum, Minimum, Average and Standard deviation. With these mathematical operations, the GDM-8261 makes complex measurements quick and easy without the complexity of manual calculations. The GDM-8261 performs temperature measurement accommodating a wide range of temperature sensors of either thermocouples or RTD (Resistive Temperature Detectors). For thermocouples, the GDM-8261 uses voltage measurement terminals as the thermocouple input and calculates the temperature from the voltage fluctuation. Most of the popular thermocouple types are supported for temperature measurement on the GDM-8261. For RTD sensors, the GDM-8261 calculates the voltage fluctuation arisen from the resistance variation due to temperature change. Either front panel terminals or scanner card terminals can be used as the input for temperature sensor. For system applications, the GDM-8261 provides USB interface and RS232 interface as standard. Up to 2,400 readings/s of data can be transferred over USB in ASCII format. Either GPIB or LAN interface is available as an option to support the ATE systems currently in use. The optional scanner card, with a field-installable design, is a self-contained multipoint measurement solution. This approach eliminates the complexities of software development for multi-point measurement and data processing. The scanner allows users to effectively measure multiple channels connected to a single GDM-8261. For the convenience of remote control and long time data acquisition, a free software, DMM-Viewer, is supported with the GDM-8261. This software allows user to remotely control the GDM-8261 without the need to give commands or to develop programming software. DMM-Viewer’s human interface resembles the GDM-8261 front panel, which significantly shortens the user’s learning time. For the data capture through a PC, the software allows user to continuously observe the measurement results before saving them into a file. Further more, the saved files can be loaded and viewed as a graph for data analysis. When GDM-8261 works with scanner card for multi-point measurements, the DMM-Viewer allows user to easily select the measurement function and range for each channel and start acquiring measurement data promptly. The GDM-8261 LabVIEW driver is also available for free download. With this driver, the user is able to create a virtue instrument on the PC for the instrument control. With DMM-Viewer & LabVIEW driver, the GDM-8261 becomes a high value semi-auto ATE system without further software/hardware investments. Interface RS -232C, USB, Digital I/O 1. All specifications are ensured only under a single display. Power Line Frequency 45 Hz to 66 Hz and 360 Hz to 440 Hz 3. 20% overrange on all ranges, except 1000Vdc, 750Vac and 10A. Power Consumption Max. 25VA 4. Resistance is for 4-wire ohms function, or 2-wire ohms with REL on. Weight Approx. 3.1kg without option 6. AC Characteristics are for sinewave input > 5% of range.